There are many effective ways to lose weight, gain muscle and get healthy. No matter which path you choose, there is usually one major gap in making better food choices. What do you actually do when you go to the grocery store? Let’s complicate it further by saying that you may have kids, limited time, a budget and little time to cook. 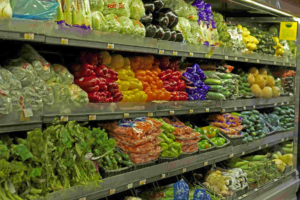 Have you ever heard the tip to shop the perimeter of the grocery store? It sounds pretty good, but unfortunately, as guidance, it falls short of being effective. The middle of the store isn’t full of zombies ready to attack you. It has a ton of great options. You just need to have a plan. The closer to the center of the store you venture, the more important it is to have a list. I don’t mind if you impulse buy broccoli and salmon. Unfortunately, it’s usually crackers and gluten free chocolate (that’s a real label) that end up dominating the cart. Nutrition information, especially on the internet, is all over the place. There are millions of different opinions and philosophies. However, we all have access to the same stores. What do we buy and how do we make sure they fit our values and budget? Most stores are laid out with a very similar floorplan. People get paid a lot of money to study the design of a store. Everything is laid out in a way to “encourage” you to buy more. Need cash? There is a bank or ATM in the front. Flowers for your significant other? Right as you walk in to the right. Thirsty? Usually the first endcap has easy-to-grab, cold beverages. That’s not to say store design is evil. Big Grocery isn’t out to poison us. It’s a for-profit business, and every dollar counts. 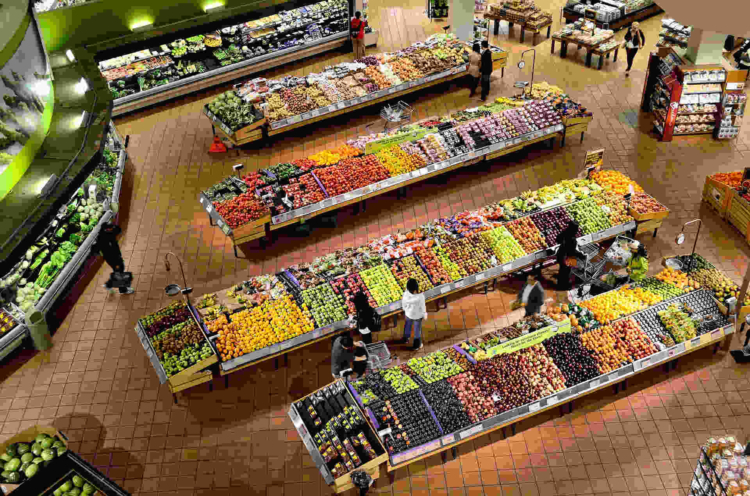 Grocery stores do not have the luxury of wide margins; they need to maximize every customer’s experience. Let’s take a tour of the grocery store together and go over strategies to make it simple, saving time and money along the way. Always go with a list. If you have a list, it will be much easier to stay on course. There are great apps available as well as printable templates . 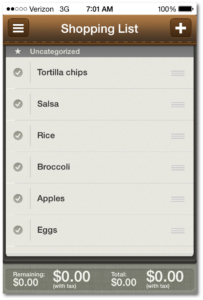 . . or just keep a running list as you eat. While most of us go for produce first since that is what we see, let’s take a different approach. Some produce needs refrigeration, as does meat and seafood. These items can also get squished by heavier boxed or canned items. Let’s head to the middle of the store first and end with the perishable items to keep them fresher. This is especially important if you have a long ride home. If you start with refrigerated items in your cart, and shop for a half hour, and have a 15-minute car ride, you are going about 45 minutes without refrigeration. So, while some stores may differ, let’s go section by section. One of the first aisles is usually the bottled water, soda and chip area. It’s easy to say “Skip it.” However, there are a few items of note. Sparkling water-A great way to add variety to regular water, and to help kick the soda habit. Chips-there are some that can be included in your plan. If you are doing salads, pick up a small bag of tortilla chips to crunch into pieces and put on top of a salad. Only buy if you are planning to do salads that week, using the chips as a crust for something like salmon, or have to host a party. Pick up some salsa, which will be conveniently right next to the chips. Buy only what you need as far as chips go, but go for a large container of salsa. You can use it for flavoring on most proteins, like eggs, fish and chicken. Pretty much everything else in that aisle. It isn’t that they are totally unhealthy, it’s that you will spend on items that you will not get much nutrition back. Flavored sports drinks, huge bags of chips and creamy dips are usually easy to over-consume while not helping you get any more vitamins and minerals. Convenience or TV meals—Some are better than others. Not ideal by any means, but some days when planning fails they can be a better option than fast food. Frozen Pizza—Healthiest option? Probably not, but not a bad thing to have. Get a plain pizza, and we can always doctor it up with some fresh veggies on top! Treats—If you are into ice cream or sorbet, pick a small container of your favorite. Be sure to include it in your plan, and spread them out accordingly. Coach’s tip: Avoid the “bad” and “good” labels. We all have our strengths and weaknesses. I hire an accountant because I have the attention span of a puppy when it comes to that stuff. It doesn’t make me “bad” for not being very proficient at it. Giving food a label will enable your client to start doing the same, like “on” and “off” dieting. Anything that is low quality and not something you really like anyway. Frozen fish sticks with fish not being the first ingredient? Skip it. Canned vegetables—sauerkraut, artichoke hearts, spinach, green beans, carrots and any other vegetable you like. It’s good, better, best, with veggies. Canned are good, fresh or frozen are better, and local in season is best. Vinegar—Great for cleaning and using for homemade broth. The acid helps extract nutrients out of bones for soup. Salad dressings—they can be deceiving; the low fat or low calorie items usually severely lack in actual nutrients, and can be hit or miss on taste. Low fat bleu cheese should just be called “bleu,” considering it has little cheese in it. Higher quality dressings can be quite expensive. We make our own dressing, which takes little time and offers a lot more nutrients. At the end of the article, you will find a summary of foods that are good to buy but better to make. In short, skip the dressing. Coach’s tip: For those 50% of clients who will reject a food journal, encourage a list. It’s more proactive, and can be done in one sitting at the beginning of the week. Their journal can be just checking off the things they planned for. Canned vegetables not in the regular section: water chestnuts, baby corn, etc. Now we are in the very middle of the store. Here we have the baking, cereal and cookie aisles. There are some gems in the baking aisle. First, let me say that I love baked goods. I’m a cookie fiend. So, with a properly planned dessert schedule . . . do what you need to do! Canned pumpkin—whipped cream and a tablespoon of pumpkin mixed together makes for a dessert by itself or a nice topping. If you have a dog, it appears canned pumpkin is the coconut oil of the animal world. Apparently, it cures everything. Unsweetened cocoa powder—great to add to already sweet shakes for a chocolate flavor and the health benefits of cocoa. 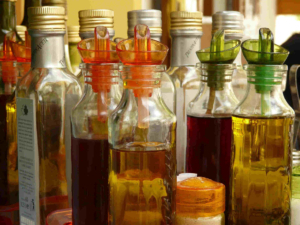 Oils—for cooking, certain oils are more appropriate than others. As a rough guide, here is a list in order of high-heat to low-heat uses: Clarified butter, beef tallow, grapeseed oil, avocado oil, sesame oil, butter, coconut oil, extra virgin olive oil. Spices—the more the better. Spices offer flavor with health benefits and very little to no energy. However, you will spend more on individual spices. I would suggest looking elsewhere for a basic spice kit, and only add what you need for new recipes as you go. Salt, pepper, basil, oregano, chili powder, rosemary, bay leaf, cumin, garlic powder and onion powder would be a great start. Somewhere between the baking aisle and cereal are the nuts, peanut butter and other nut butters. Natural peanut butters are in fashion, and if you go with one of these, store it upside down. It’s a tip I picked up to help keep the oil from coming to the top and the bottom drying out. Almond butter is another great choice, albeit expensive. Different nuts have different benefits, so go with almonds, Brazil nuts, pistachios, cashews, pecans or any other type. If your store has a bulk section, you’ll save money and buy only what you need. Go with unsalted and you can spice as needed. Raisins and other dried fruits can be found here as well. Raisins are a great addition to salads, but beware. They are easy to overeat and snack. This is a downfall of mine. Have them as your dessert after a meal, but don’t keep reaching in the box! Dried apricots and other fruit are good buys as well. Buy with no sugar added, and enjoy in small amounts. Remember, too much dried fruit over too little time will set you up for a bad day tomorrow! Ah . . . the cereal aisle. Perhaps no other aisle has so much advertising money behind it. With so many claims and cartoons, it’s easy to get confused about what is healthy and what is not. The advantage of ready-to-eat cereal is the convenience. Pour it in a bowl, add milk and eat. The disadvantages are that it often doesn’t keep us full through lunch and can lead to more snacking. It also doesn’t offer a wide variety of nutrients, like fat, protein and the various vitamins and minerals that a balanced meal would provide (although most cereal is fortified and enriched, it’s not quite the same). It is also easy to overeat; one measured cup of cereal isn’t much. All that being said, if you want to do cereal, try a brand that doesn’t list sugar or high fructose corn syrup as the first ingredient and spice it up with extra berries or fruit. Use a small bowl to prevent overeating. Also in the cereal aisle is oatmeal. 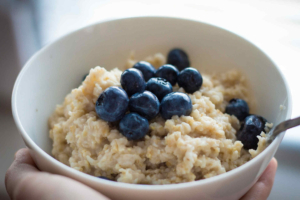 Steel-cut oats and instant oats are great staples to have on hand. They offer fiber and are a great vehicle for other nutrients like fruit, dried fruit, cinnamon, flax and chia seeds. Either steel-cut or instant is fine, because the healthiest foods are the ones you’ll actually prepare. “Quick” or “instant” oats are appropriately named. Moving past the cereal, we get to the cookie aisle. If you are going to enjoy cookies as part of your plan, I would say make your own to get more nutrition. If you are purchasing, do so with a plan; it’s easy to grab more than you need, especially if you have kids. Involve them in the process of list making, and let them pick one or two items out in advance. Coach’s tip: Be real. Your client sees you as this artichoke-eating pushup machine. You must relate. Yes, you may be “better” at exercise and nutrition, that is why you were hired. It doesn’t mean that you don’t love the occasional chocolate chip cookie or a nice plate of bacon. This section really depends on your store. Some put great products and great pride into this section. Others don’t focus on it at all. Look for cheese that has been aged a year or more. It’s worth spending more money on quality cheese. A little will go a long way in keeping you full. Deli meat, while far from perfect, is a great convenient option. You can give your omelet a protein boost by adding some deli turkey, make a chef salad or have a great sandwich. It is more expensive then carving your own meat, but the convenience may be worth it for you. In this section you may also find rotisserie chickens. Usually in the $5-7 range, they can make a great meal. Save the bones for stock! For a complete meal, the prepared foods section has a lot of good cold salads. Coleslaw, potato salad, and quinoa salad can be filling side dishes. Bread can be a healthy addition to a diet, despite the recent demonization. In my opinion, fresh baked bread with quality ingredients is much more filling then the packaged brands, just remember, it will only last a few days. Keep portions reasonable. Another option is sprouted bread, which has a great flavor and often comes frozen. Having it frozen is a good way to portion yourself. Just take out a slice or two and wait 10 minutes for it to defrost. Okay, we’re back to where you walked in, with fruits and vegetables in the front and meats and seafood toward the back. Produce should be the bulk of the cart. However, it doesn’t last very long so buy only what you need. Usually a big trip for the week plus a small one to replenish fresh meats or vegetables will do. Wild-caught, pasture-raised, organic and everything else related to quality and source will be available. It is beyond this article to go over pros and cons of these and other terms. Look at it this way, stocking up on chips and cookies to go along with wild-caught salmon is missing the big picture. Make sure that you have a habit of produce and proteins as a foundation of most meals. Once you are in a good place, you can explore moving up the quality chain. Don’t force veggies on yourself. Pick a few that you like, and slowly expand. They are delicious when prepared correctly. They aren’t punishment, so keep an open mind. Coach’s tip: Meet your clients where they are. If you see hesitation or a lack of confidence, back off. You enthusiastically want to fill up their cart with vegetables. Find out which ones they like and maybe compromise on adding one or two. Decide on fruit by where it can fit in your meals and for the sake of convenience. Too often fruit goes bad, because it sounds like a good idea at the time, but the week goes by and we forget to eat it. If you are doing fruit with breakfast, decide which ones and purchase only what you need. Berries are a good idea to go with oatmeal, cereal or as a side dish. For convenience, bananas, apples and pears will always work very well. Price matters here. You will pay more for premium cuts, but beauty is in the eye of the beholder. If you have a crockpot and a pressure cooker, the tougher cuts of meat such as roasts can be made tender and delicious. Dark meats for poultry such as legs and backs can be cheaper as well. Shop the sales and freeze the meat. Grass-fed/pasture-raised meats will be much more expensive in a store. If this is important to you, look at local co-ops to buy meats in bulk and freeze. Seafood is often a black-or-white issue for people. You like it or you don’t, and chances are good that in a family of four someone won’t like it. It is a wonderful source of protein, so hopefully it can be part of the plan. Just like the meats, shop the sales. If salmon is cheap that week, have a few salmon dinners. Frozen fish can be a good option too, as most of the time the fresh fish section has been frozen on the boat and thawed out before display. However, the frozen brands are usually portioned filets and quite expensive (but it goes on sale, so stock up when you can.) When shrimp or shellfish are on sale, it may be time to make a soup or gumbo. If you purchase seafood, be sure to plan to use it soon. Store it in the refrigerator in a bowl of ice. Eggs, for their part, are one of the highest sources of protein. They also have other vitamins to offer, such as choline and vitamin A. As a rule, the darker yellow/orange the yolks, the more nutritious. Pasture raised brands can be very expensive, as can omega 3 and organic offerings. Find a happy medium, like Eggland’s Best. Hard boiled eggs, quiches and omelets are easy food prep items for the week. Vegetarian proteins can also be found in this section. Tofu and soy tempeh are great options to add to dishes such as stir fry. Try buying a small amount and look for an interesting recipe. Slowly expand your repertoire, and perhaps you can find a few dishes you like that keep you satisfied. This can save you some money and cut down on meat consumption in favor or more vegetables. Cold beverages are often found next to the dairy section. They are priced at a premium because they are cold and you can drink right now. It will always be cheaper to buy bulk non-refrigerated drinks or to make your own. Kombucha is growing in popularity, and can cost over $3 a bottle. Making your own can be as little as 10 cents a bottle. It just depends on how often you consume these products to see if it makes sense to make it yourself . . . which brings us back to the good to buy and better to make list. Going to the grocery store can be daunting, especially if you are just embarking on a new program. Start with a small, basic list. Expand the list each week as you find a new recipe or two and you’ll be on your way to better food choices. I laid out the basics, but it is by no means a complete list. That is your job. Your family traditions, values and food preferences will ultimately dictate what you buy and prepare. You must take ownership. Simply following a plan that someone else laid out for you will only last so long. It also doesn’t have to be expensive. My wife and I were spending $1000 a month in groceries. We cut it down to $500 by not using the card, just taking out $500 in cash and making it work. We have since settled at around $600 without really thinking about it. We cut out the things we really don’t need that add up, like cold beverages, snack foods and non-sale meats and seafood. It was easy for us and it can be for you as well. Marc Halpern can be found at marchalpernsblog.com. He is the lead trainer for Anthem Fitness at TPC Summerlin, a PGA tour owned facility and owns his own nutrition consulting business. He has trained athletes in hockey, soccer, volleyball and football. Marc first became interested in the field when he himself lost over 65lbs while still in high school.